The Pew Environment Group’s Global Ocean Legacy Program is working with the government of Bermuda, nongovernmental organizations, and scientists to establish the ‘Bermuda Blue Halo,’ a very large, no-take marine reserve to protect the Sargasso Sea within Bermuda's waters. The weed Columbus and his crew saw on their journey was Sargassum—large mats of seaweed floating on the water’s surface that support diverse and unique marine life. Unfortunately for the crew, this “golden rainforest” did not signal their approach to land. In fact, they were near Bermuda and still some 1,000 kilometers (620 miles) from the East Coast of North America. Nearly the size of the continental U.S., the Sargasso Sea was named after Sargassum. Some of the marine species relying on this habitat have evolved unique shapes and color patterns that camouflage them among the plants. The Sargasso Sea is set off from the surrounding Atlantic by four ocean currents—some of the strongest in the world. Loggerhead sea turtle (Caretta caretta). : Loggerheads are considered an endangered species and are protected by the International Union for the Conservation of Nature. 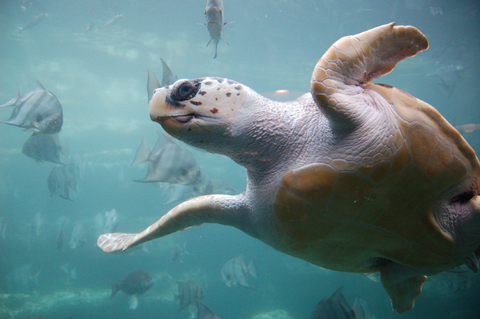 Loggerhead sea turtles spend most of their lives in the open ocean and in shallow coastal waters. They rarely come ashore, with the exception of the females' brief visits to construct nests and deposit eggs. Hatchling loggerhead turtles live in floating mats of Sargassum algae. Photograph by ukanda. Photograph and text courtesy of Wikimedia Commons. Bermuda’s ocean environment depends on Sargassum and marine life has adapted to this unique ocean habitat. The plant creates a nutrient-rich seaweed forest that hosts communities of fish, shrimp, crabs, worms, and snails. Although Columbus observed “a solid mat,” these floating expanses of Sargassum are actually made up of many small clumps that combine into larger patches. The Sargassum species which define the Sargasso Sea do not attach to the ocean floor or shore. Instead, small gas-filled pods grow along the stems, making them buoyant. New plants proliferate as stems break off the central cluster. When winds drive the weeds to shore, they dry in the sun to a dark brown. In time, they help form dunes and fertilize plants. In the summer of 2011, piles of seaweed as high as 1.5 m (five feet) covered shorelines from the Caribbean to West Africa. Learn more about Global Ocean Legacy’s work in Bermuda, and around the world. This news and all of the images are courtesy of the Pew Environment Group, 21 February 2012.